Please tell me you have seen the awesome, interactive red houses of Mi Casa, Your Casa on our piazza. Need to put your feet up after walking the galleries? 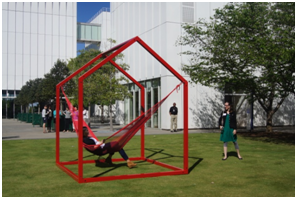 Head outside to take it easy in one of our hammocks! Hungry? We’ve got a Nathan’s Hotdog cart and ice cream in a nice shady corner. Need a creative idea to get your kiddos hands moving and minds working? Bring them every weekend for some fresh-air fun at our Family Art-making Workshops! 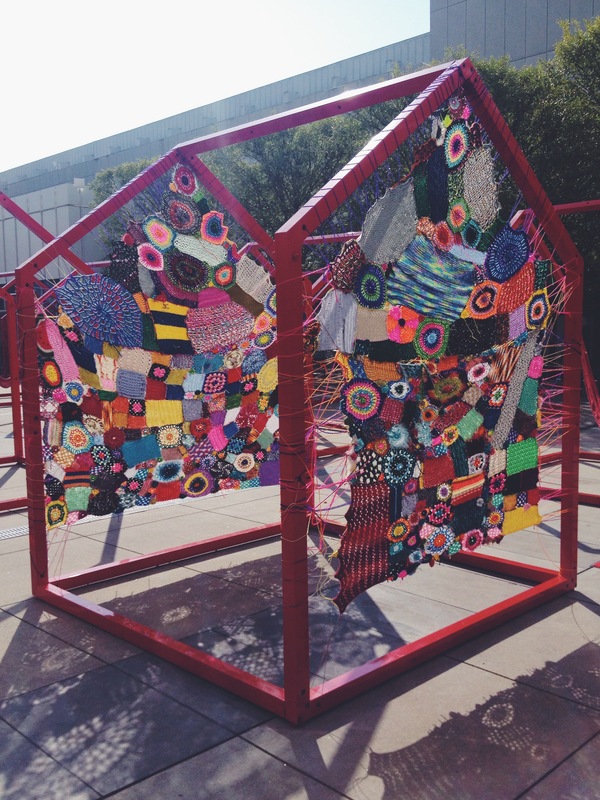 The whole Woodruff Arts Center worked together for months to knit and crochet pieces for a “yarn bomb” of one of the red houses. It was installed this week! Swing by with the whole family to make your own yarn-bombed bookmark to take home. In case of rain, we will move inside to the Robinson Atrium and have just as much fun! Next time you visit the museum, go on a little scavenger hunt. You might be surprised at what you find! Go up to the fourth floor of the Stent Wing. From the elevator, move straight ahead weaving throughout the maze of interesting furniture and contemporary jewelry. See that big reflective loopy chair? Turn to your left. If you see a life-size metal horse, you are on the right track. Once past the horse, turn right at the pink angel on the wall. This gallery has a smaller room within the room. Once you have found your way into its center, you have found your prize! The colorful pieces in this room are the works of folk artist Nellie Mae Rowe and they can be great way to engage your little ones at the museum. Rowe was a self-taught artist working in materials that kids can truly understand: crayon, colored pencil, and even bubble gum! She portrays creatures with features of different animals, houses, and people in a way that children of all ages can relate to. Her imagination was vibrant and untamed. 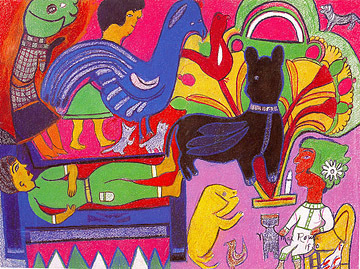 In one drawing, whose title gives this exhibition its name, she drew herself in her bed at night with the creatures of her imagination swirling about her head. A fun activity based on the works of Rowe would be to have your kids draw pictures of their dreams and creatures of their endless imaginations. Have you ever visited the museum and witnessed hordes of happy school children milling about the building? Well, those kids are so happy because we have a ballin’ School Programs team that keeps them engaged, stimulated, and fed! There are a whole lot of components that go into making a school visit run smoothly and a very important piece of that puzzle is the lovely Ellen O’Brien, School Programs Assistant Extraordinaire. Q: How long have you worked at the High? This month I celebrated my first full year working at The High! Q: What is it that you do at the Museum? I am the School Programs Assistant so I assist with the planning and implementation of programs and services for teachers and K-12th grade students. One of my favorite things about my job is watching students who visit the museum make connections to classroom lessons in new and exciting ways! I often see students surprise both themselves and their teachers with their creativity and insight. For me personally, art makes learning come alive so to see that happen for others is so fulfilling. I also especially love working with all of the Education Department who constantly inspire me with their resourcefulness and can-do attitudes! 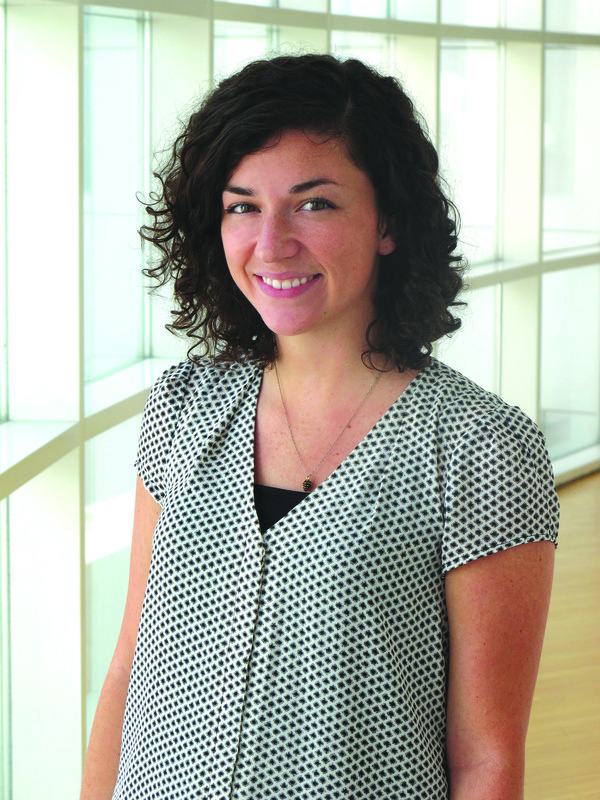 Q: What is your favorite work of art in the permanent collection and why? It’s so hard to play favorites with all the wonderful art in our permanent collection! I do always find myself drawn to Anselm Kiefer’s painting Dragon (Drache). Before I worked at The High, anytime I would make a trip to Atlanta to see a new exhibition I would often try and make my way up to the skyway galleries to visit this monumental piece. I love to stand in front of this large painting and feel oh-so-small as I take in the rich textures Kiefer created with the choppy ocean waves and the dramatic night sky. This painting also includes a constellation depicting a mythological character that Keifer found being used throughout various cultures as a representation of evil within human nature, so fascinating! Q: What do you like to do when you’re not working at the Museum? Lately, I have loved being outside soaking up this warm spring weather at the park or on a friend’s porch. I also like creating art or crafts of my own, enjoying good food with friends, and finding great live music to enjoy!